James Van Der Zee was a self-taught African American photographer of the 20th century. He photographed the lives of African American predominately in Harlem where his first photo studio opened in 1916. Currently his photography collection is available at The Met and many of his phots can be viewed on their website. 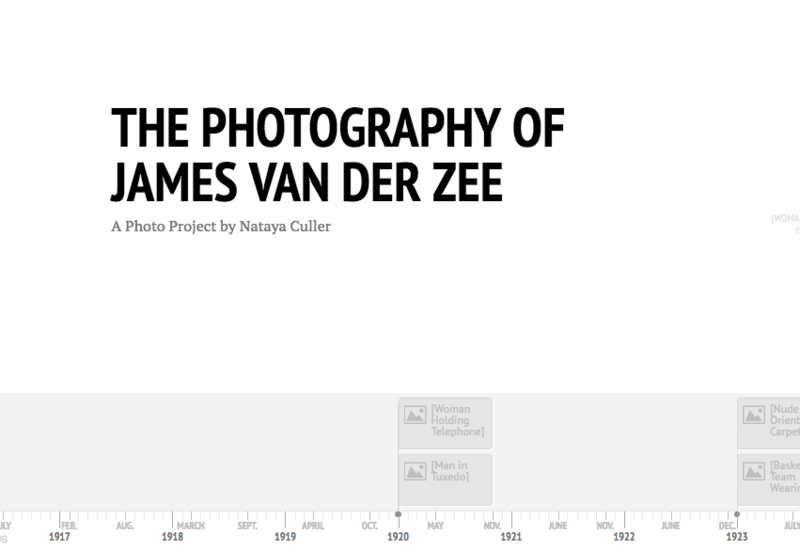 My project has changed multiple times through the process of creating it but I settled on a timeline of some of James Van Der Zee’s photographs. The first step I took to creating my timeline was scraping the website. I scraped the Met website on the page featuring James Van Der Zee’s photos and converted it to a JSON file. Next I used Sublime text editor to import the JSON file. I did a “loop.” through the data and did a print statements for the four items I wanted out of the date which were image, title, date, and medium. The loop and print statement worked but it was giving me all the items in the data even the ones that didn’t have images. The Met Museum has place holders on their website to inform patrons that the item is there but is not viewable. That was the first problem I ran into. I noticed within the Met data that all the items without images ended with “.png “while the items with images ended with .jpg. To correct the problem I first tried an” if statement “with an “.endswith” “.png” and a pass statement so it would only give me the items with images and not the ones without images. That didn’t work. Then I tried a continue statement instead of a pass statement and placed it before my print statement and it skipped over the items I didn’t want and gave me only the ones I wanted. Next I created a spread sheet using the information from the printed data. The spread sheet I used was from Knight Lab’s Timeline and it gave me a second problem. The information needs to be precisely entered and the title line header line need to be filled out or it will not work. Another thing that wasn’t much of a problem is that the Met web site only has the pictures in a small resolution for copyright reasons so when they are uploaded onto the timeline they are also small. They’re not too small so I didn’t consider it a major problem but I would have liked for them to be bigger. Ultimately I’m satisfied with my project and the timeline I’ve created.